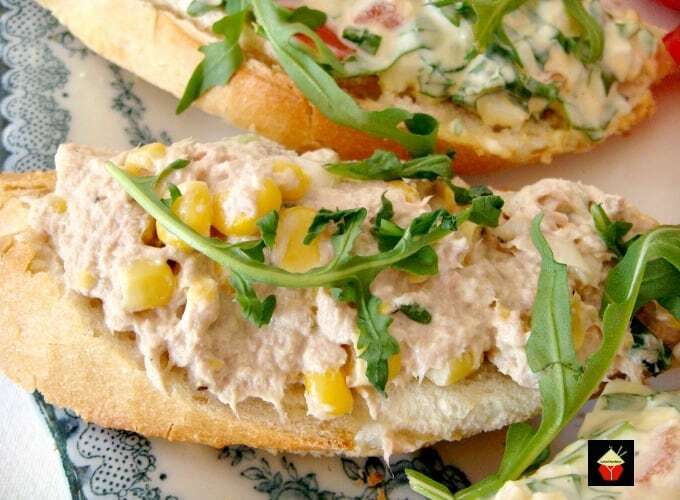 Easy Open Sandwiches with a variety of 2 delicious filling recipes, Egg and Bacon filling and Tuna and Sweetcorn. 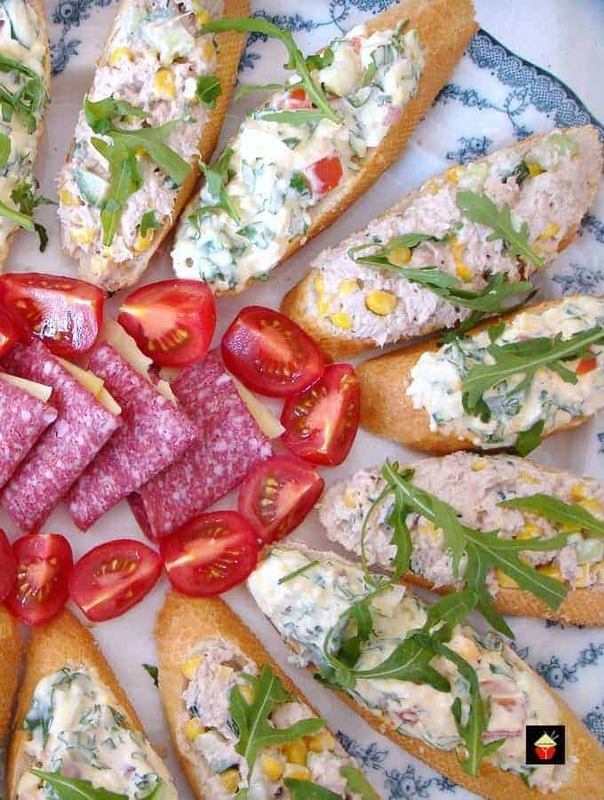 Both delicious and great for parties and picnics too! 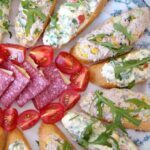 Easy Open Sandwiches! Gosh, the fillings in these sandwiches are wonderful! It can often be a challenge to make sandwiches look good and also taste good and a little different from your average ‘sandwich’. Here I have made two different types of open sandwiches, displayed on a large platter with some salami and simple sliced Vine Tomatoes, full of flavour and absolutely delicious. The fillings I used are Egg and Bacon with scallions and Tuna with sweetcorn and rocket/arugula leaves. 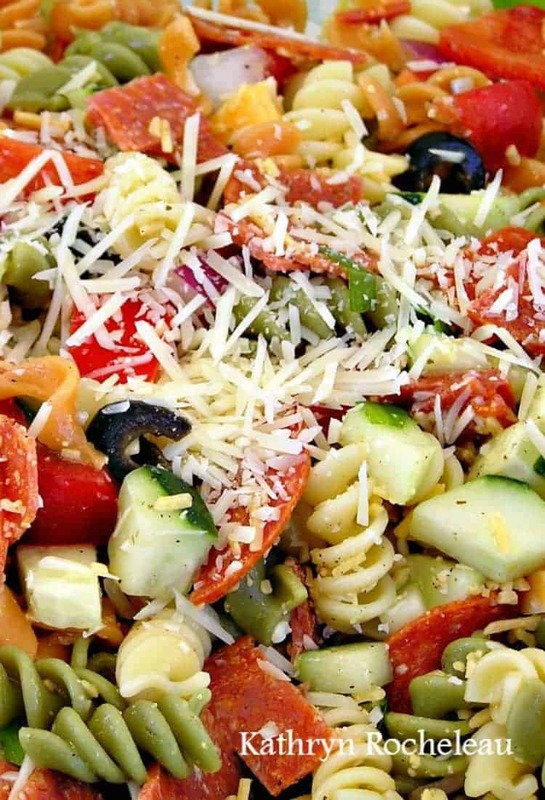 Both delicious and offer a variety to your diners, and also very budget friendly! 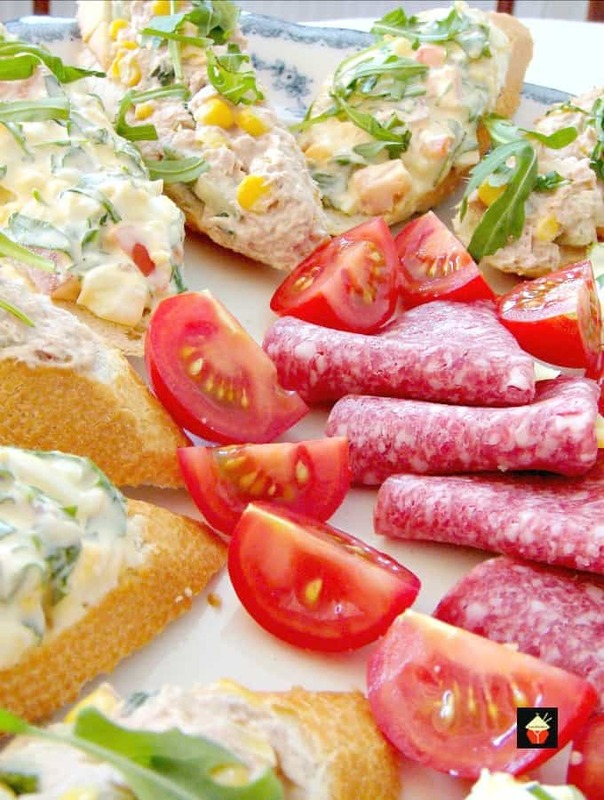 I love making Easy Open Sandwiches. They’re great if you need to make ahead, for example, if you are having a party, or going to a picnic, you could make up the fillings the night before and refrigerate overnight, store in an airtight plastic tub and transport to your picnic, and simply place the filling on the bread when you get there. 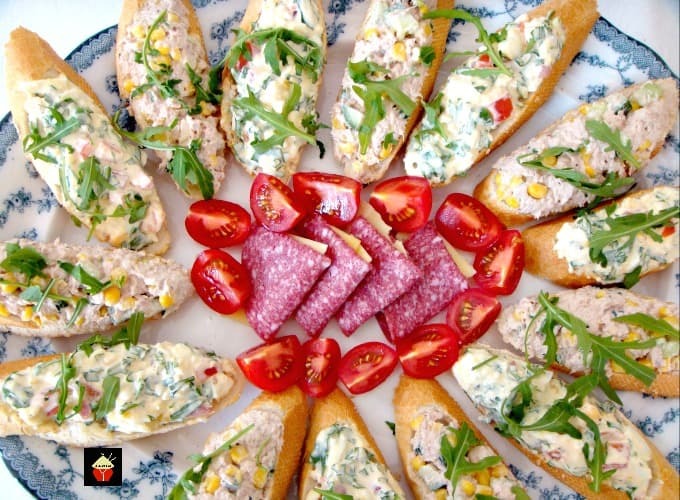 You could also just put the filling in some serving bowls and let people help themselves to adding what they want to their French bread slices, or they can just have some of the fillings on their own like a salad. 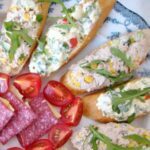 At the end of the post I’ve added some salad suggestions for you so you can choose a few to go with your easy open sandwiches. We also have a lovely Mushroom and Spinach Quiche recipe which is very popular and I think would compliment the easy open sandwiches as part of your buffet selection! 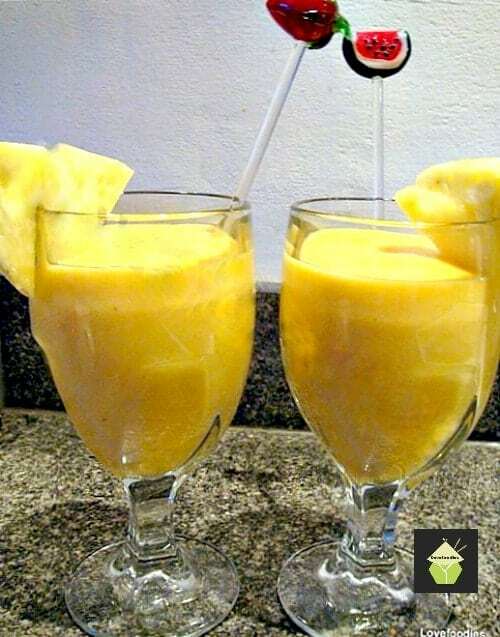 For drinks, we have a very easy Tropical Smoothie, oh it’s so delicious! Try it! You could make up a big jug for serving! 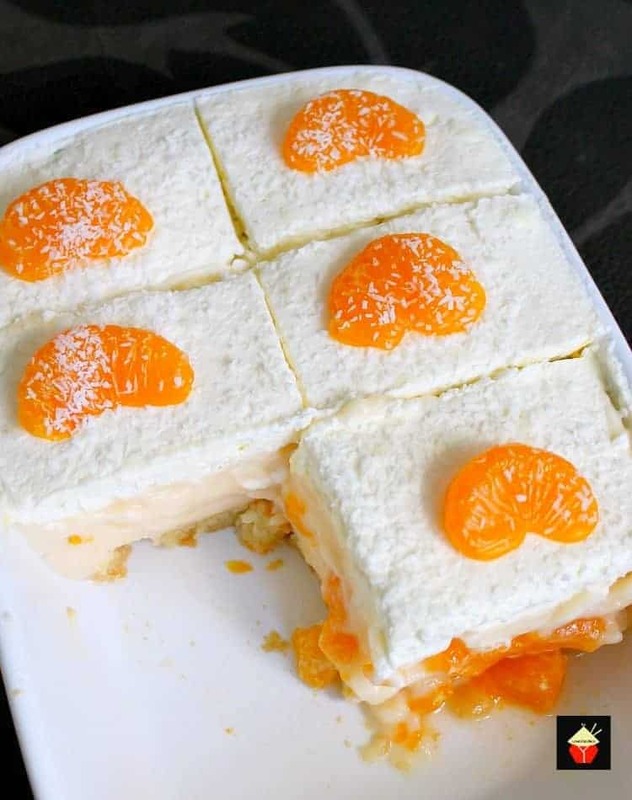 and if you’re thinking of serving something delicious for a dessert, I would recommend our Easy Mandarin Dessert. You can make it ahead and everyone loves it! 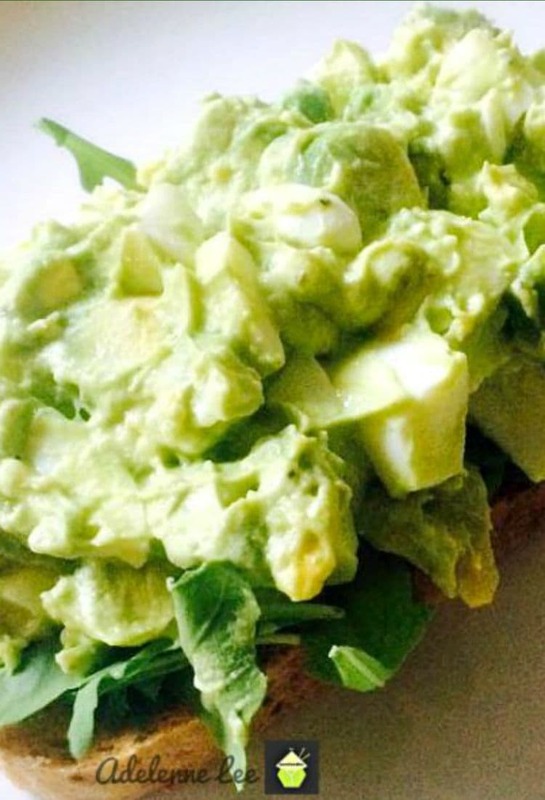 So let’s get straight to the recipes and see how we make our easy open sandwiches. Please enjoy! 75 g / 1/2 Cup Bacon Lardons or bacon slices chopped. 1. Boil the eggs until hard boiled (about 10 minutes) and allow to cool in cold water. 2. Fry off (no oil needed) the chopped bacon, drain on kitchen paper and allow to cool. 3. Chop Spring Onions / Scallions. 4. Once everything is cool, add the eggs to a mixing bowl and using a fork, roughly break them, don’t mash too much as they are nicer a little chunky. 5. Add the bacon, tomato & Spring onions/scallions to the bowl, season with salt & pepper, then a tablespoon at a time, add the salad cream/mayonnaise, stir gently to combine, and add a little more until the mix is a firm consistency and the ingredients ‘hold’ together. You can make the sandwiches as creamy or chunky as you like. Store covered in the fridge until ready to use. 1. Drain the tuna & sweetcorn and add to a mixing bowl. 2. Add the other ingredients and combine with a fork. 3. Add the mayonnaise a tablespoon full at a time, and continue adding and combining until the mix holds together. To make the sandwiches, slice the baguettes at an angle like you see I have done, and place enough sandwich filling on top and then arrange on a serving plate. I did not add butter to the bread as there is plenty of moistness and flavour in the sandwich fillings. 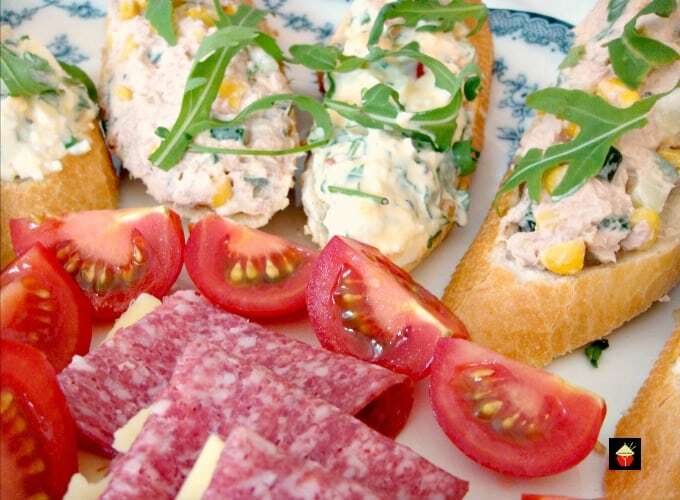 Arrange the sandwiches around the plate and add some other goodies in the middle. 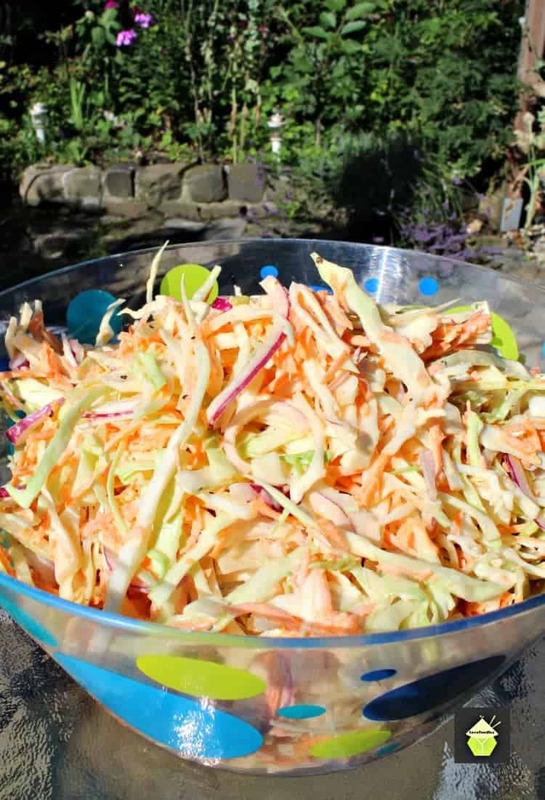 You could also add my No Fat But Creamy Coleslaw to serve as a side, very delicious! click on the photo below to see how it’s made. 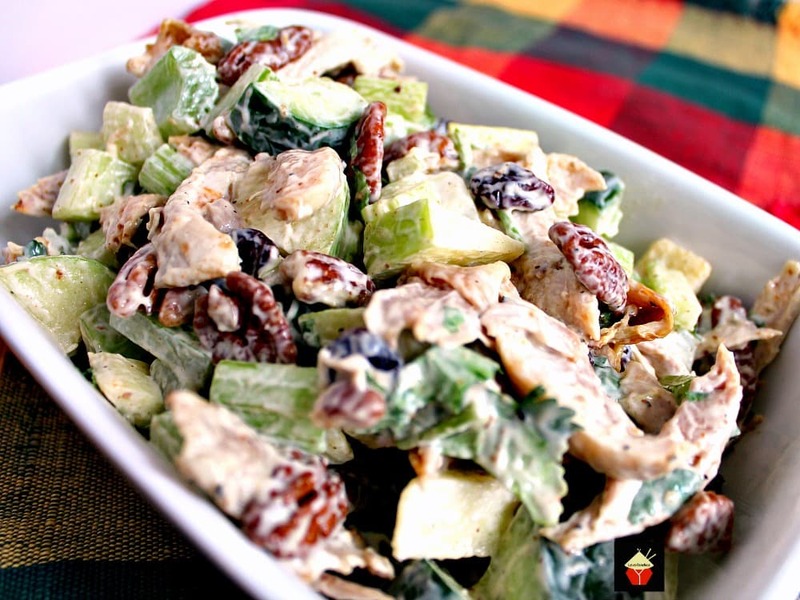 Here are a few more delicious salad recipes for you to enjoy! Here I have made two different types of open sandwiches, displayed on a large platter with some salami and simple sliced Vine Tomatoes, full of flavour and delicious. The fillings I used are Egg and Bacon with scallions, and Tuna with sweetcorn and rocket / arugula leaves. 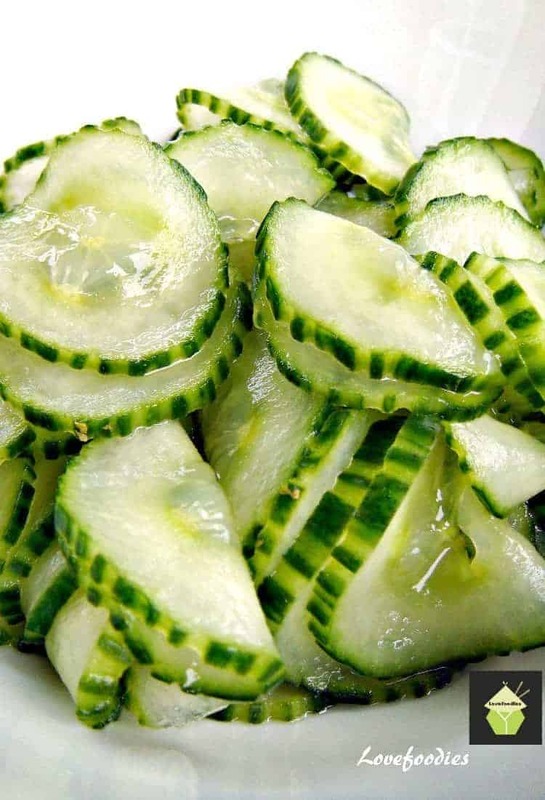 Both delicious and offer a variety to your diners, and also very budget friendly! French Baguettes as many as you need! Boil the eggs until hard boiled (about 10 minutes) and allow to cool in cold water. Fry off (no oil needed) the chopped bacon, drain on kitchen paper and allow to cool. Chop Spring Onions / Scallions. Once everything is cool, add the eggs to a mixing bowl and using a fork, roughly break them, don't mash too much as they are nicer a little chunky. Add the bacon , tomato & Spring onions / scallions to the bowl, season with salt & pepper, then a tablespoon at a time, add the salad cream / mayonnaise, stir gently to combine, and add a little more until the mix is a firm consistency and the ingredients 'hold' together. You can make the sandwiches as creamy or chunky as you like. Store covered in the fridge until ready to use. Drain the tuna & sweetcorn and add to a mixing bowl. Add the other ingredients and combine with a fork. Add the mayonnaise a tablespoon full at a time, and continue adding and combining until the mix holds together. Season with Salt & pepper. Cover and refrigerate until ready to serve.